I wanted to make a raitha with Bisi Bela Bath and decide for cucumber raitha but then I change my made and wanted to add a twist with raw mango. It turn out to be too good, tangy, refreshing and so simple to make just perfect for this summer. 1. Wash, peel and grate cucumber and raw mango, finely chop green chilies. 2. In a bowl add cucumber, mango, green chilies, salt and curd. 3. Mix everything well and add cumin powder, mix again. Serve chill and garnish with cumin powder. Goes well with any paratha, variety rice, we had it with Bisi Bela Bath. ~ You can add cilantro for garnishing. ~ You can also sprinkle little of red chili powder for that extra touch to the raitha. Wonderful Combo,Adding raw mango is a nice twist...Yummy raita. Indeed very refreshing, Priti. I like the idea of adding raw mango for the tnagy twist. Refreshing and tempting raitha.. looks inviting dear !! Mango is a great addition to this raita, looks yummy! Nice combination, will have to try out some time! Wonderful combo,definitely will try it..
Looks so refreshing and a very lovely combo. Great combo..drool worthy,can't wait to try this. Great recipei Priti. I should try to make it sometime soon. I know hubby would love something that looks as good and taste delicious as this dish. thouhg i have made cucumber raita many times..never thought of adding raw mango..will follow ur recipe next time and tell how it came out....rather the difference it made!!! I have taste it in one of my friends house..it is so yum and tangy..Thanks for the recipe dear..
love this combo..need to give it a try! This is one perfect and interesting raita... so good. 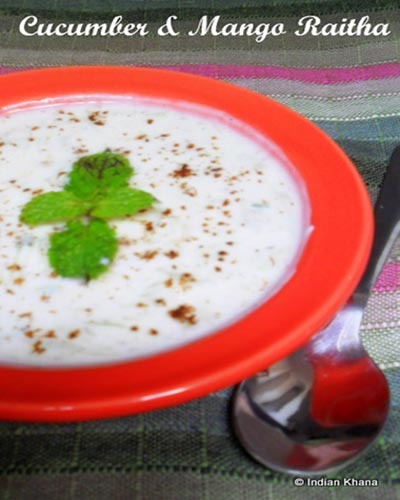 this is such a flavorful and totally delicious raita - two thumbs up! Nice tangy twist to raita..yummy!! Raita looks tempting.. perfect for summer.. nice presentation too.. I think my comment got removed, nice combo priti,looks and sounds great! Lovely and tangy raita Preethi ..yum! Great Pics ! I am sure the raita too must be simply yummy ! Raita looks yummy and tempting. Lovely combo. I am drooling at everything you've pictures - I see the sambar sadham too :) Yup!